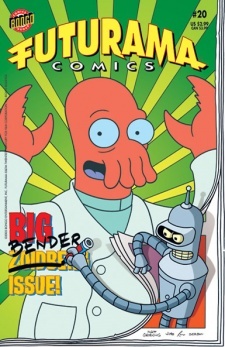 "Bender Breaks Out" is the twentieth comic issue, which was released 8 June, 2005 in the US. The crew are on their way to a delivery. Leela violently awakens Bender who was asleep for the last eight million light years. Fry leaves the package under the doormat because no one is home, Bender throws his beer bottle behind him which breaks over the package. The crew return home, with Bender complaining the whole way. Bender continues to feel unappreciated. Zoidberg has the sniffles. The staff decide to ignore his complaining. Bender complains about them commenting on his IQ. Zoidberg uses Bender's body as a trash can for a used tissue, this causes Bender to become very angry and he goes on a bending spree through the building. Somehow, Bender has torn a hole in the comic, he goes through. Bender is now on a blank page of the comic. Fry, Leela, Amy and Hermes return to the hangar to check the damage and see the hole. Fry wants to go in after Bender but Leela stops him. Bender has curtained off the hole on his end and is sleeping. This is supposedly the end of the story. At Bongo Comics, Bill Morrison (editor and creative director of Bongo Comics) introduces a new section of the comic called "Backstage at Bongo". He begins a tour of Bongo's offices and introduces some of the staff. Tom King mentions some of the art of Bender for this issue, this prompts Bender to fold down the corner of the page and enter Bongo Comics. Realising that this is a place that makes comics rather than a cult that worships him, Bender wanders away. The Professor is made aware of the hole Bender has made in the space-time continuum and that he has disappeared into it. He explains that the fabric of space-time is as thin as the pages of a comic book and attempts to demonstrate tearing a comic up. In order to get Bender back they first find out where he is, a Starbucks, by using one of the Professor's devices to see what Bender sees. Lrrr, Ndnd and three other Omicronians want revenge on Bender for destroying their vacation planet (spilling beer on their door step). Hermes tells them that unfortunately he can't tell them where Bender is. Lrrr disintegrates Hermes. Farnsworth tells the Omicronians that Bender is in the hole, they head in. They arrive on the double blank page Bender had been on, which is now covered with trash, and find the fold leading to Bongo Comics. Matt Groening arrives at Bongo and Bill tries to tell him that Bender was there, he doesn't believe it. The Omicronians enter Bongo and ask for Bender. Bill says that they can't give him to them, then is disintegrated. Matt sends the Omicronians to Fox Studios. Amy has swept Hermes' ashes into a tissue box and the Professor announces that Bender's hole ends in a 21st century comic book. He goes on to explain that the reader of the comic book will have to seal off the section of the comic where Bender went berserk so that that section will never be read again. They stand in the Hangar and pretend to be telling Bender that he's great and they appreciate him. Farnsworth says they aren't doing it well enough. Amy and Leela don't know what to say so Fry offers to perform a haiku about Bender. Farnsworth says it doesn't matter what they say, its just a comic book. Fry opens his mouth wide and performs his haiku. The Professor says that was "god-awful". It is explained that the comic should be folded so that the right of page 21 matches the left of page 6. They can't see Bender and assume nothing happened. Fry spits out a used tissue. They decide to try the next page. Bender continues to feel unappreciated, Farnsworth, Leela, Amy and Fry stand in the Hangar and tell Bender that he's great and they appreciate him. Zoidberg has the sniffles. Amy and Leela don't know what to say so Fry offers to perform a haiku about Bender. Bender complains about them commenting on his IQ. Zoidberg uses Fry's wide open mouth as a trash can for a used tissue. The Professor says that was "god-awful". They try again, Fry rants about how good Bender is, Leela and Amy agree with him. They think it's going well, Zoidberg turns up, still with the sniffles. Fry continues gushing about Bender and makes a comment about his intelligence. Leela spots Zoidberg. Amy realises that they forgot to fix Zoidberg's use of Bender as a trash can, so she pushes the Bender Viewfinder over to him. Fry continues, Bender decides to let the crack about his intelligence go. Fry, Leela and Amy are happy to see Bender. Hermes also returns, he doesn't know where he's been. Amy hides the tissue box with Hermes' ashes in it. Bender finishes his Mocha Latte. Bender continues to feel unappreciated, Fry rants about how good Bender is, Leela and Amy agree with him. Zoidberg has the sniffles. Fry continues gushing about Bender and makes a comment about his intelligence. Leela spots Zoidberg. Bender complains about them commenting on his IQ. Zoidberg uses the Bender Viewfinder Amy has moved towards him as a trash can for a used tissue. Fry continues, Bender decides to let the crack about his intelligence go. Bender throws his drink in the air and leaves for his anger management class. Fry wants to see this so he walks over to the Bender Viewfinder, where he finds Zoidberg's tissue. Zoidberg asks for more tissues, so Hermes gets out the tissue box with his ashes inside. Leela notices the continuity errors and wonders what happened to the Omicronians. At Fox, Lrrr explains his idea for a new show, the Fox executive loves it. This is the second comic to break the fourth wall, this also occurred in US#014, US#046 and the game. The folding method described also causes the loss of the page immediately after the joined pages. Hermes was born in 2959, the year is 3004, so he's 45. Due to the unusual structure of this story, the UK version was not split. When this issue was re-released in Australia as a collector's edition, which also contained the previous issue, the Professor's dialogue mentioning page numbers was revised to reflect the numbering of the collection's pages. Backstage at Bongo Comics Group was reprinted in Bongo Comics Free-For-All 2006. Bender: [With head on backwards.] Hey, what'd you do with my door? Bender: Yeah, yeah, I can read the door. Farnsworth: ...Bender blazed a trail through the space-time continuum that starts in this building and ends... [He holds up his Wendy comic.] ...in a 21st century comic book. The Professor reads Wendy comics. When Hermes dies, Amy and Fry reference South Park with "Oh my god! They killed Hermes!" and "You bastards!". Lrrr is a fan of Matt Groening's "Life in Hell", and gets his copy of "The Big Book of Hell" signed. Several continuity errors are found in this issue, however they were deliberate. On page 19 "through" is misspelled "though". In "The Cure for the Common Clod" it was said the common cold had been wiped out yet in this issue Zoidberg has "The sniffles". Backstage at Bongo Comics Group, which ended up fused with the story. This page was last edited on 28 March 2014, at 18:25.